I mentioned in yesterday’s post, that we just got back from a family cruise to the Caribbean. We had so much fun, it felt like a dream! For those unfamiliar with how a cruise works (I was), besides being out at sea, you stop in varying ports to experience the local scene. I specifically booked our cruise to include the 3 ports that we went to: Cozumel, Roatan, & Belize. 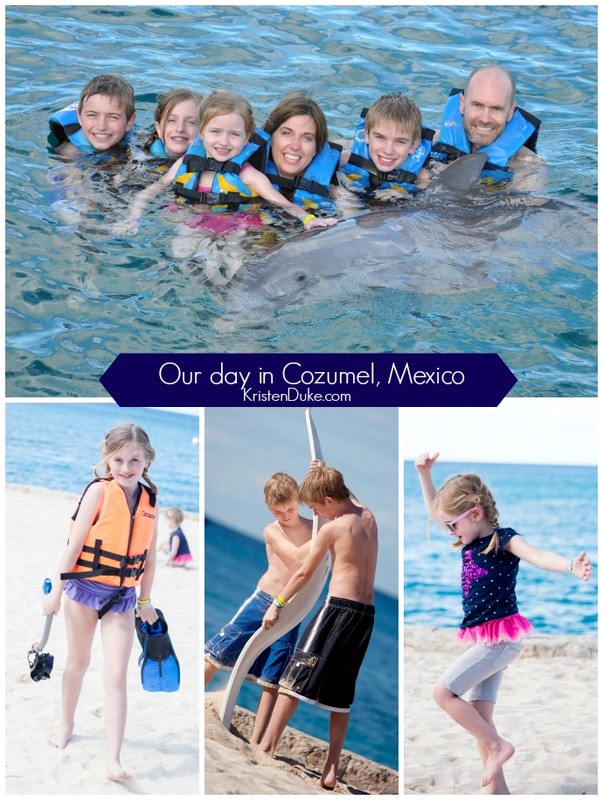 Today I’ll share what we did in Cozumel. 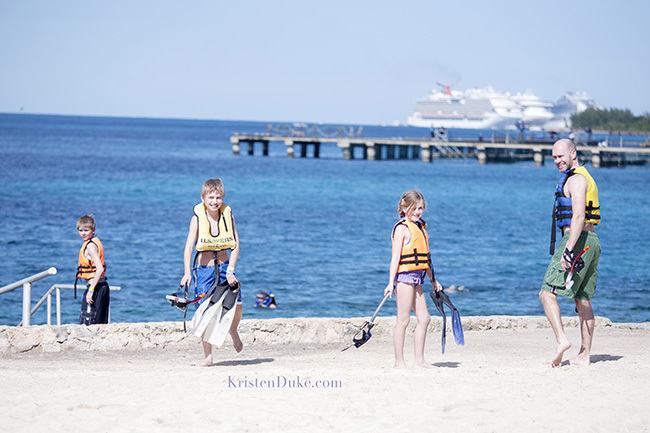 I’d heard of Cozumel many times before, I knew it claimed beautiful beaches, I also heard if felt a lot like the US with a Wal Mart and Sams Club not too far away. Because of the activity that we booked, we didn’t get to experience a whole lot of the local scene, but we got a little glimpse. I like to surprise my family, so I hadn’t told my kids what we were doing at each stop. I was also worried that weather would cancel the excursion, and if that happened, they wouldn’t be as disappointed, not knowing what we were doing. Exiting the boat was an adventure in and of itself. When we got on the boat, we went through an above ground glass tunnel. This day, we got off on the bottom of the boat and walked along side it’s enormity. We just couldn’t get past how HUGE the ship was. Walking next to it, put it into perspective. My kids kept asking as we hopped in the taxi what we were going to do, but I kept mum. We asked our driver to take us to the Chankanaab National park. I booked this excursion through Shore Trips, partly because some sites said the child had to be 8 to participate, this one said age 6. Though my daughter is NEARING age 5, I figured it’d all be ok. It seemed more about height and ability to swim, and both are on her side. When we were checking into the park the kids pointed and said, “Look, dolphins!” That’s when I said, “What do you think about swimming with them?” To that I got cheers! We had about 2 hours to play in the water before our scheduled outing. We rented some snorkel gear, and played in the water. 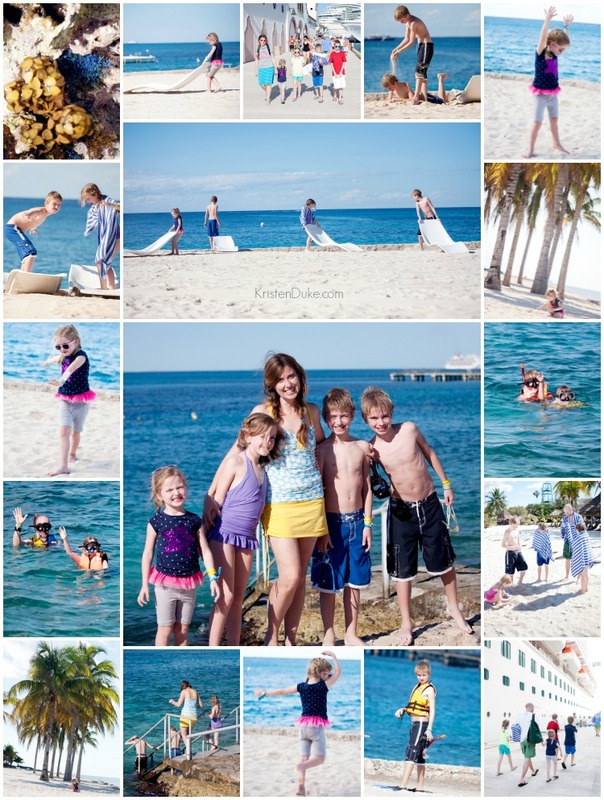 Our youngest didn’t love it as much, and I got my fill as well, so we hung out on the beach and took pictures. We saw colorful schools of fish, coral, all sorts of fun. 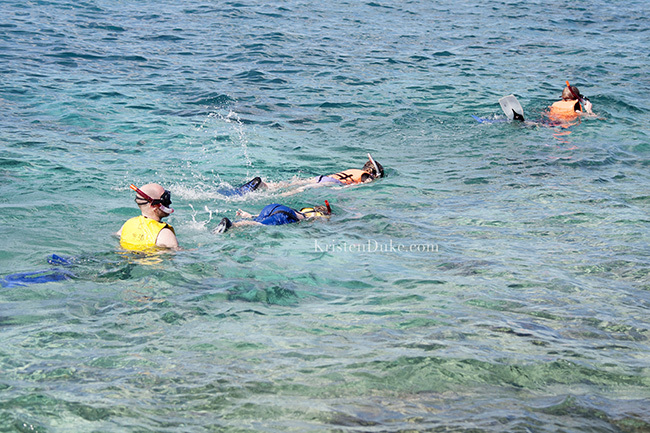 The three big kids had never snorkeled before, so that was pretty fun in and of itself as well. We headed back to the Dolphin Discovery area for our turn with the dolphins. My youngest wasn’t so sure about the whole idea, but I kept talking up how awesome it would be. When I still saw hesitation, I went against everything I believed in, and I bribed her. I told her she could have an ice cream cone when we got back on the ship (never mind that she would be fine to have one anyway) if she were brave and just got in the water with us. 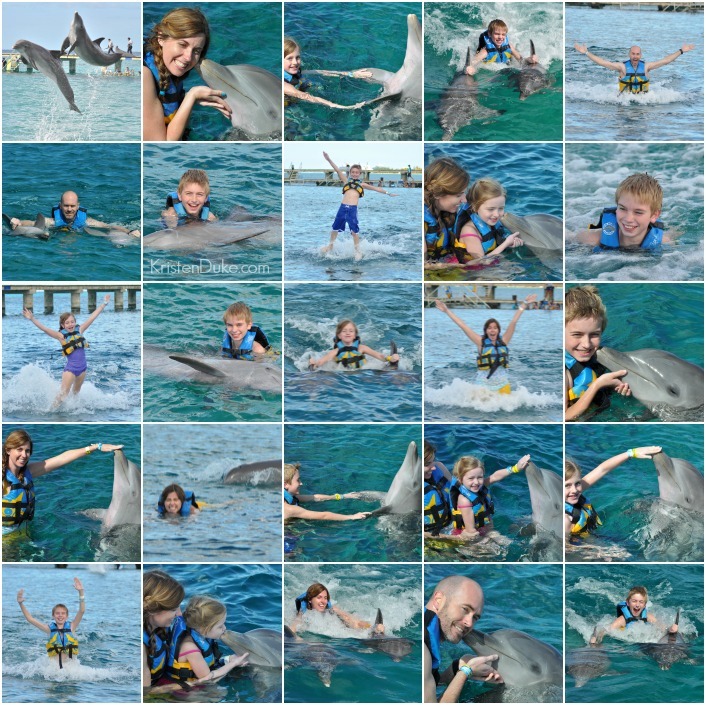 She had a life jacket on, and was in mine or my husbands arms the whole time, and once close to the dolphins, she really warmed to the idea. She thought it was so fun to pet them, get a kiss from them, and even give a kiss (which I didn’t necessarily enjoy doing). She laughed and smiled, and I felt happy that it all worked out. If not, one of us would have to get out of the water with her. Once in the water, we had so much fun and spent nearly an hour interacting with two dolphins: Frida and Arimus. One of the highlights (and I spent more $$ for this, I figured I might as well go for the gold) was to have a “foot push” from the two dolphins. Each of us took our turns, swam out about 40 feet, and floating on our stomachs with head up, in superman position–arms extended. The dolphins then swam behind me, put their noses to the arch in my foot and PUSHED at the same time, which pushed me out of the water! It was such a crazy fun feeling! I was shocked they were strong enough to do that for each of us, we just had to keep our knees locked. It was such a fun day! Tomorrow I’ll share about our day in Roatan, Honduras (prob. my favorite spot). 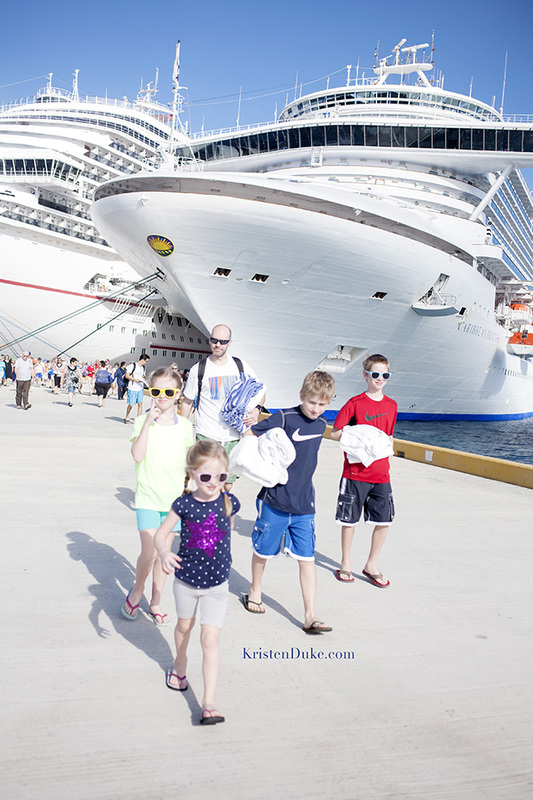 To see pictures of our time on the cruise with tips and a printable checklist, check out How to Plan for a Cruise.